Kudrya Stepan Aleksandrovych doctor of technical science, professor, State Prize of Ukraine in Science and Technology, Director of Renewable Energy Institute, National Academy of Sciences of Ukraine, Head of Renewable Energy sources department, National Technical University of Ukraine "Igor Sikorsky Kyiv Polytechnic Institute". Scientific and scientific-practical results of Kudrya S.A. marked by many national and international decorations and rewards. For significant contribution to the development of Ukraine, contribution for Ukrainian people and charitable activities he was awarded of the Order of "Saint Prince Vladimir" IV degree. Kudrya Stepan Aleksandrovych was born on March 20, 1947 in Rivne Oblast of Ukraine. After graduating from the Kiev Polytechnic Institute (1971) started research activities at the Department of Electrochemistry, where in 1978 he defended his dissertation. For almost 50 years active research and practical activities of Kudrya Stepan Aleksandrovych linked with development of renewable energy in Ukraine. Works in this area were initiated in 1979 at the Kiev Polytechnic Institute and further extended at the Institute of Electrodynamics, NAS of Ukraine, where in 1996 he defended dissertation for the degree of Doctor of Sciences on "Systems of accumulation and transformation of renewable energy." 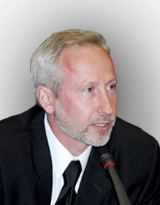 In 2003, with the participation of Kudrya Stepan Aleksandrovych were established the Institute of Renewable Energy, National Academy of Sciences of Ukraine, where he continued his scientific work as deputy director, and since 2016 - as director of the IRE NAS of Ukraine. Kudrya Stepan Aleksandrovych is known scientist in the field of renewable energy and has a basic and applied research results to create combined energy equipment and systems based on the research processes of transformation and accumulation of renewable energy. Under his scientific leadership developed methods and mapping the potential of renewable energy, as a basis for creating the atlas of renewable energy potential in Ukraine, the use of which is one of the determining factors of large-scale introduction of renewable energy in Ukraine. In IRE NAS of Ukraine and Inter – Branch Scientific and Technical Center for Wind Power Engineering performed research works in consequence of which was significantly increased energy efficiency of industrial wind power station within the state scientific support of "Integrated program for the construction of wind power stations in Ukraine." This is not a complete list of scientific work results of scientist. He is the author of 287 scientific papers, 15 monographs including the textbook "Alternative and renewable energy", has 45 patents and copyright certificates. Equally important is its educational activities – Kudrya S.A. attaches great importance to preparation of scientific and engineering personnel in the field of renewable energy for its initiative in NTU "KPI" created the Department of renewable energy, which he headed from 2006. Continuing scientific researches Kudrya S.A. manages of education postgraduate students, he is the head of the specialized scientific council for doctoral and master's dissertations on specialty "conversion of renewable energies", the chairman of the Academic Council IRE NAS of Ukraine. New scientific direction and performance of Kudrya S.A., its students and employees received recognition of domestic and foreign scientists. Kudrya S.A. actively participates in international cooperation of scientists in the field of renewable energy, its activities awarded a diploma of "Eurosolar." During his labor activity Kudrya S.O. proved himself as skilful organizer and scientific adviser, working as director at the Institute of Renewable Energy, National Academy of Sciences of Ukraine contributes to the advancement of knowledge in the field of renewable energy and the implementation of the results of basic and applied researches in the economy of Ukraine. Great attention Stepan Aleksandrovych pays for the legislative and regulatory framework to stimulate renewable energy in Ukraine for strengthen energy independence. Unconditional talent, backed by diligence, provides for Kudrya Stepan Aleksandrovych success in development of creative ideas and designs, and huge store of knowledge and scientific expertise contributes to their practical implementation in real projects. Collective of the Editorial Board of the International Scientific Journal for Alternative Energy and Ecology (ISJAEE) congratulates Kudrya Stepan Aleksandrovych with the 70th anniversary, We wish you good health and further success!